Laura Bryant of Prism Yarns in Florida has designed this stunning and oh-so-soft Arctic Dreams Cowl featuring her hand dyed Prism Plumette™ yarn base, a short pile 100% Nylon yarn that creates an incredibly soft and luxurious knit fabric for this cowl, paired with a skein of coordinating Prism Symphony Merino-Cashmere-Silk yarn, which is worked in rows separating the colours, and produces the beautiful folds when draped around your neck and the lovely horizontal lines when worn over your shoulders. Please scroll down to see both the gradient and tonal Arctic Dreams Cowl samples. Our first Arctic Dreams Cowl model is worked in the gradient Dark Autumn 1 Kit, which features Plumette shades (from top to bottom) Tumbleweed • Olivine • Tahoe • Bark • Yosemite. The pairing of these shades is outstanding and a testament to Laura Bryant's eye for colour. Just stunning! Here we have the Arctic Dreams Cowl™ in the tonal Prism Silver 901 colour. Semi solid kettle dyed colours like this produce an alluring dye effect and will become a wardrobe staple. 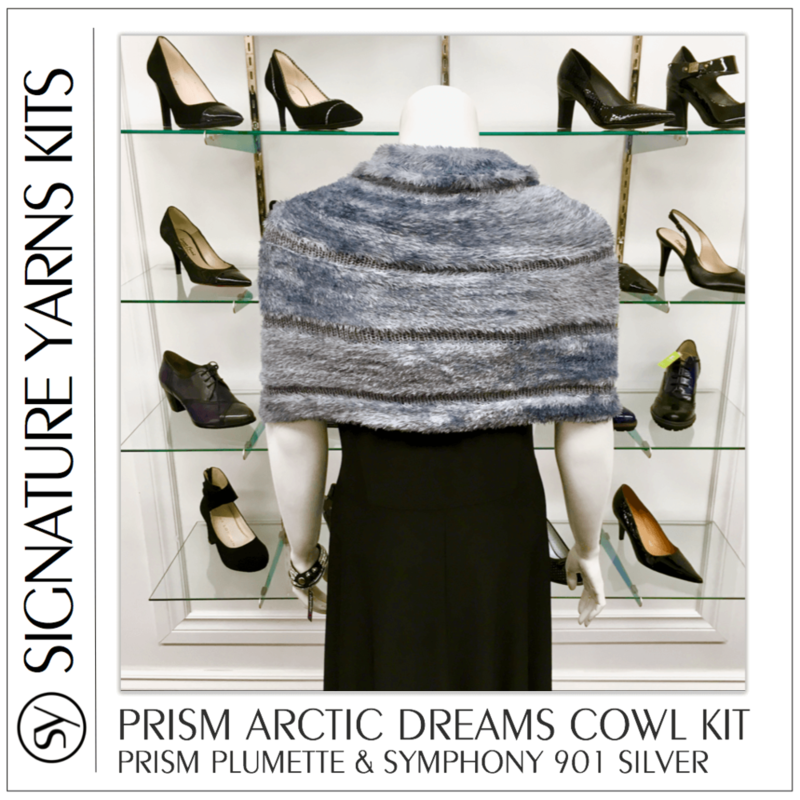 The Arctic Dreams Cowl Kit is available to order online now using this link. If you don't see a gradient or semi-solid shade that appeals, please contact me by email signatureyarns@gmail.com or by phone 416-795-5500 and I'll be happy to order the kit colour you prefer. Knit some fabulous as Signature Yarns. Lovely transitional colours of Prism Saki in Peony and Pale Denim knit up in Robin Hunter's Glenhost Wrap. Make this a your next investment piece and year round favourite to pair with a dress or Denim Jacket. Wraps and shawls are such versatile accessories to wrap and drape around your body to suit your taste and comfort level. Click on the images to take you to my Shop Project Kits page to order your Glenhost Wrap in Saki. Be part of the slow clothing movement. Return to planning your wardrobe, doing with less but investing in textiles with excellent, long lasting qualities that will create wearable items that you are proud to say you made. Look at this gorgeous shade of Antique Gold hand dyed on the Rayon Metallic yarn base from Blue Heron! Just stunning. I see many of my clients wearing this as the fab knee length cardigan for the office, a halter to wear under your fave black jacket for that upcoming cruise, or your everyday favourite pullover in this cool on the skin, very soft rayon yarn base with just a kiss of metallic thread, which is not abrasive and has a beautiful drape and sheen. Very subtle, very stylish, very Signature Yarns. Be inspired with yarn and fabric pairings from Signature Yarns. Pictured is a beautiful cotton/rayon plaid fabric from my personal stash that I paired with the very wearable shade of "Shale" in Prism Delicato, a lace weight Tencel fibre. Don't let the words "lace weight" scare you off. Options abound in how to use this yarn; it can be hand knit or crochet on size 3mm needles, knit on your Japanese standard gauge or Passap/Superba home knitting machine on Stitch Size 6 or for hand knitters, you can double or triple the strands you knit with to create a Sport or Light Worsted gauge of fabric using larger needles. The cotton/rayon plaid fabric and the Shale Prism Delicato will wear great from mid-summer through to the fall transition in October. Prism Delicato is available to purchase on my website in Shale plus other variegated and tonal hand dyed shades. Knit Some Fabulous! Signature Yarns' Pop of Colour Cowl Kit! Be fabulous, knit fabulous and look damn sharp in our Pop of Colour Cowl Kit featuring the wondrous Prism Plume. This is a hand dyed nylon faux-fur cowl that produces the most beautiful silky knit fabric, sure to keep you cozy and chic all winter long as Plume is a great insulator of heat. The Pop of Colour Cowl kit is available in both brights, neutrals and dark neutrals in 50+ hand dyed shades. Available to order securely online at at signatureyarns.com or if you prefer ordering by phone, please call me directly 416-795-5500. Thank you! As a retailer I don't do boring. I don't do "the same". At Signature Yarns I pride myself on the wide assortment of hand dyed yarn bases and colours that I stock. I invite you to explore my website and the yarns I have online to date and check back often as I add more content daily. Featured in this photo at top are two skeins of Prism Petite Madison; a 4Ply spun-single of merino, silk and cashmere in #107/Plum and Indigo, paired with Prism Yarns Plume in Smoke, a silky hand dyed nylon. Available to order online or by phone at Signature Yarns. Call me direct at 416-795-5500 with any product information questions. Love this shade of Mossy Place Organic Cotton hand dyed for us by Blue Heron Yarns. A fine example of the "everything" colourway talented hand dyers can create. The Belvedere Wrap is a versatile pattern designed by Robin Hunter exclusively for Signature Yarns. Worked in Organic Cotton the resulting fabric has a soft, supple hand, perfect for the "no-sheep-for-me" sensitive skin crowd and for both men and woman alike. A generous 630 yards per skein, Organic Cotton is in stock in 7 shades. The Organic Cotton Belvedere Wrap Kit includes one skein of yarn plus the Robin Hunter pattern and is priced at C$50, plus applicable taxes and shipping. Exclusively ours. This awesome hoodie by Michael Kors provides inspiration for you to craft your own denim blues version in hand dyed and quality brand name, next-to-the-skin soft merino wools, all in practical care machine wash gentle fibres from Signature Yarns in Toronto. Be inspired. Craft your own. I love taking inspiration from menswear collections such as Hermès, which is produced in France. You may not have the open-to-buy budget to afford their ready to wear clothing but you may possess the skill set to take inspiration from a timeless classic pullover and create one to fit your frame and build using a beautiful kettle dyed merino wool such as our Malabrigo Rios. No one knows more than me how seductive are the myriad hand dyed colours available to us in our yarn lines but some times its best to invest in a colour which will give you the best bang for your buck and years of wear, and for men that often comes down to grey and black. Just does. Hand knit sweaters made with luxury fibres selected from the best of the shearing season, carefully processed and dyed and shipped to the opposite side of the world, such as Malabrigo yarns, are indeed investment pieces, but always balance that out with the reminder that they provide you hours of pleasure in crafting a garment to fit your body, pride in your skill for having made and finished the sweater to your exacting standards, and the long-lasting reward of the years of wear you will get from knitting with a quality merino wool such as Malabrigo Rios. Malabrigo Rios is available from Signature Yarns in 20 tonal and variegated shades. C$18.50/skein. • 100% Superwash Merino Wool. 100g skein/ 192m. Gauge: 18 stitches x 24 rows. 4.5mm - 5mm. Order online or if you prefere to order by phone, contact me at 416-795-5500 or via email signatureyarns@gmail.com to order. We'll get your sweater lot on its way to you. Free shipping on orders over C$150.00 to anywhere in Canada and the continental United States. Todays eye candy brought to you buy our friends at Fleece Artist in Nova Scotia who hand dyed this gorgeous Thrum Mitten Kit which is a combination of Blue Face Leicester Aran weight hand knitting yarn and wool roving in their fabulous Bermuda colourway. Signature Yarns Thrum Mitten Kits are priced at C$33.00 each, including Thrum Mitten pattern and are available to order online or by phone in 20+ fabulous colourways. I love the Waterlogue app for iPhone and iPad, which transforms photos into watercolours. Brilliant to my eyes! Here is an interior of my studio using Waterlogue. The colour, the fit, the proportions, all still relevant in 2017! Timeless inspiration for knitters. This would be lovely in the Coral shade of Prism Saki, a beautiful blend of 80% Superwash Merino and 20% Nylon. For those who can't stand animal fibres next to their skin, we offer this shade in 2 varieties of hand dyed 100% Tencel, for silky smooth and cool knitwear that you will love to wear over and over. Love the extremes of yarn gauge used in this sweater from the Lanvin Pre-Fall 2015 collection by Alber Elbaz. Chunky braided cables appliqued to fine gauge jersey. God is in the details and for Autumn-Winter 2015 Vivienne Westwood and her partner Andreas Kronthaler presented a great menswear collection true to the Westwood ethos which does challenge conventions about menswear and as always, Vivienne and her very talented team deliver the wild and fantastical with traditional and all created using the most exacting standards. The influence for the collection is HRH The Prince of Wales. Westwood is a huge fan of Prince Charles and of his leadership in the areas of organic and sustainable farming and climate change. So take a good and hard look at the styles presented and you can see the reason for the season. The royalty influence is very apparent in fabric choices from the traditional suitings and for topcoats with gorgeous, saturated colours, all paired with the continuing Westwood influences for casual clothing and footwear. Note the pound note sneakers above featuring the same Queen Elizabeth II print as used on the clothing. Bet your bottom dollar the triple flaps and tapered toe shape of the shoes you'll see copied by fast fashion and trickle down real soon. Also evident and copied for years is Westwood's continuing influence on men's clothing proportions. Note the cut of casual pants and blazers and the pairing of the two. What one reads as "new" and "innovative" has all trickled down into popular clothing styles and Westwood continues to this day to be a global fashion trendsetter. Style and flavour baby! Style and flavour. As always the Vivienne Westwood Man collection includes exquisite knitwear in the form of fine gauge classic knit pullovers to more detailed jacquard, screen prints and textured lace knits. The hand knitters in the crowd will note the ever popular "Frost Flowers" stitch pattern used for a oversize pullover in pale grey shown below. The team at Michael Kors are very good at their game of producing outstanding clothing collections season after season. Love the fabrics used in the outerwear; the soft tailoring and subtle finishing details along with the great footwear, including those grey leopard print loafers in the second slide and the Camo-print jacket and top coat! I love the predominant use of grey. For some of us Grey Rules! Nothing wrong with that. Obviously retailers will have a choice in fabric colours but this monochromatic look makes for a nice on the eyes presentation and grey has been a wardrobe staple for over a century so rock on. This collection speaks to the success of the brand which presents quality clothing with innovative and unique touches season after season. Great investment pieces for any man.